This project brings together in a coherent, understandable, and relevant way the major astrology of the next few years, for future predictions. We are going into some very complicated and intense times. The pivot point for the next 5 year period astrologically looks to be in the summer of 2010 with the spectacular grand line-up of planets Mars, Jupiter, Saturn, and Uranus all forming squares to Pluto and the Node. We have not seen anything like this in a long, long time. This ebook I have written, 2009: Mounting Challenges Through the Turn of the Decade, it has an overview of the world today, crucial background cycles information, and then a specific timeline and projected manifestations in the world due to the astrological influences therein. There is definitely a set of challenges we will be going through. And much more in easy to understand, non-astrological jargonistic text that will have you riveted to the story…. But is it not just summer of 2010 that holds the essential dates, there are several major chronological junctures just down the road starting in 2009 and ending in 2011. 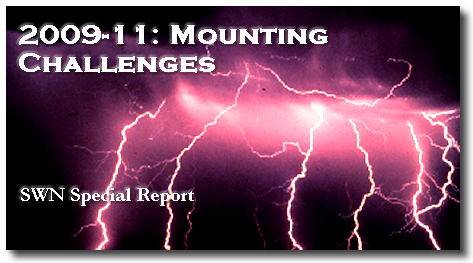 The ebook Mounting Challenges 2009 covers these phases and what they will mean to you in detail. Writing, maintaining, marketing, and doing research for this site takes quite a bit of personal time, energy, and resources; which I freely give as it is something that I just find that I do. However, for the site to continue it needs support from readers. For a donation of just $7.77 to the SWN operations fund this comprehensive, concise, and conceptually dense document will be yours. It is 29 pages of relevant information, with graphics and background material.